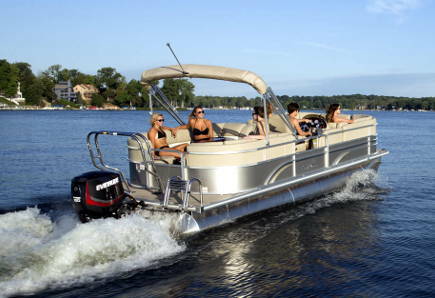 115 HP, seating for 12, and a premium stereo… everything you need for a great day on the lake! While our Sunchaser may not be a speedboat, with 115HP on deck it’s definitely no slouch. Whether you’re looking to kick back and relax or enjoy a tube ride, the sunchaser is happy to oblige. Getting a group together and spending some time on the lake is a great way to enjoy summer. With room for 12, our Sunchaser will be a great boat for you! If you’re into watersports, don’t worry- while the Sunchaser doesn’t have a wakeboard tower, it’s got more than enough power to pull a tube. Eight hour rentals include a tube. If you aren’t interested in high speed, but still want a boat that’s got enough power to be fun, you (and 11 of your friends) are going to enjoy our Sunchaser. Don’t get us wrong: with 115HP the Sunchaser definitely moves, but if you’re looking for power, the Four Winns H200 SS is the better boat for you. Of all the boats we have, this Sunchaser is the easiest to operate. It’s stable, predictable, and perfect for novices. This boat is the ideal choice if you’re looking enjoy the lake with a group of people. 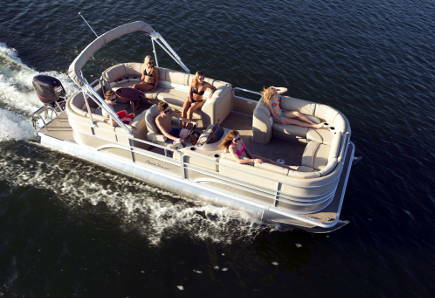 Whether cruising, lounging, or towing a tube, the Sunchaser is a great boat for your group.